If this card is Synchro Summoned: You can equip 1 Link Monster from your GY to this card, and if you do, place Borrel Counters on this card equal to that Link Monster’s Link Rating. This card gains ATK equal to half the ATK of the monster equipped to it by its effect. When your opponent activates a card or effect (Quick Effect): You can remove 1 Borrel Counter from this card; negate the activation. You can only use this effect of “Borreload Savage Dragon” once per turn. Borreload Savage Dragon can be one of the best cards you can have on the field. Generic level eight Dragon, the higher Link monster you have in the grave, the better. Gaining the ability to equip a Link and use the amount of links it has as negation in addition to the half ATK gain from the equip monster, Savage Dragon is savage. The play you always see if you follow the meta is equipping Skull Dread to Borreload Savage and making it incredibly hard for your opponent to mount offense. Yes, you are limited to once per turn, and it is only when BSD is Synchro Summoned, but if you are facing down a potential four negater with 4400ATK on turn one, you have a mighty hill to climb unless you have an easy out. Even with one negation Borreload Savage Dragon is a great card. Negations are key in the game and BSD will force your opponent to play around it, whether it’s because of negation(s) or ATK. Gotta say, I really love this card. Borreload Savage Dragon is a Level 8 Dark Dragon-type Synchro Monster with 3000 Atk and 2500 Def. BEWD Stats have always been good and will continue to be good. Being Dark doesn’t really make a difference unless you are trying to make this in a Virus Deck. Dragons have a lot of utility in many decks. Even ‘Borrel” is becoming an interesting archetype. BSD is generic, requiring any Tuner and any non-Tuner to properly Synchro Summon. However you don want to Synchro Summon this after any Link play or it will have no effects. Upon Synchro Summon, you can attach a Link Monster from your grave to BSD and then it gains Borrel Counters up to the equipped monster’s Link Rating. BSD also gains half the Atk of the Link Monster for itself. Before continuing, this is the offensive effect that awesome monsters tend to have. Going above and beyond “normal” Atk values is how the game is won. The defensive effect is a hard once per turn that let’s BSD negate any card or effect as a quick effect by removing one Borrel Counter. Stopping the opponent from doing what they want to do can be extremely frustrating, especially if you negate the effect of a card that is going to the grave. No downsides and great artwork make Borreload Savage Dragon an easy choice to run in decks that have tuners. It’s been a hot minute since we had a really good cover card for a set, and while Cyberse Clock Dragon and Cyberse Magician were cool, they seemed niche. Here we got one useful in more decks, Borreload Savage Dragon. Savage Dragon is a Level 8 DARK Dragon Synchro with 3000 ATK and 2500 DEF. Stats are amazing for a Level 8 Synchro, DARK and Dragon also make a lovely combination. The summoning requirements are any Tuner and any non-Tuner(s) which is what you want to see on good Synchros. Upon being Synchro Summoned, you can equip a Link Monster in the graveyard to this card and place Borrel Counters on it equal to that monster’s Link Rating. Useful in Link Spam decks that love to Link Climb, especially those decks that abuse multiple Saryuja Skull Dread (while they can of course), so this can have something in the grave to equip to it for those counters, you’d like a Saryuja for those 4 counters, but I’m sure a Link-2 for two counters will be more common, maybe a Link-3, only do a Link-1 if you feel you really have to.. Savage Dragon also gains ATK equal to half of the ATK of the Link Monster you equipped to it, so the aforementioned Saryuja gives this a 1400 ATK boost, an extender Link like say Isolde for example would give it a much smaller 800 ATK boost, but getting a boost in ATK with an already 3000 ATK body is great to have, plus that base stat makes losing the equipped monster not the end of the world considering the counters stay, and that’s the important part. The final effect is a hard once per turn, as when your opponent activates a card or effect, you can remove a Borrel Counter from this card to negate the activation. It doesn’t destroy, but most cards this negates are going to the graveyard anyways, whether it’s a Spell/Trap or a monster since this has a strong body to run it over. Having access to generic negation like this is amazing, and Link Spam decks now have access to it assuming they are running the right Level combinations and Tuners. 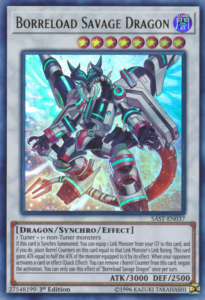 Summoning multiple is unnecessary since the negation is a hard once per turn, but one in a Link Spam deck like Crusadia Guardragon variants could make this work as a one of, because having negation of any form is great to have. Art: 4.5/5 I prefer the original Borreload Dragon better, but Savage Dragon is a fine retrain of that art. Borreload Savage Dragon is a mouth full of a name, no? Dark, Dragon, Level 8 Synchro with 3000 attack and 2500 defense, these are good things. A Synchro Summon here is performed by a Tuner Monster and 1+ Non-Tuner Monsters. So, in short, if you Synchro Summon this card, you can equip a Link Monster from your Graveyard to it, and if so, you place Borrel Counters on this card equal to that Monsters Link Rating. Next we have an attack increase, where BSD gets attack equal to half the Link Monster equipped to it by the previous effect. At 3000 base attack, even a minor increase is going to turn this card into a juggernaut. 3500-4500 shouldn’t be that hard to obtain, or even more, obviously depending on what you have in the Graveyard at the time you use that effect. Finally, for a Quick Effect, we have negation. If your opponent activates a card OR effect, by discarding a Borrel Counter, you can negate the activation of said card. This is great, and more versatile than it may look initially. Effect here is optional, so if the card/effect won’t hurt you or you choose not to stop it, you don’t have to. It is once per turn, so that helps balance a powerful effect on a powerful card. Art: 5/5 Definitely a Machine, could easily be a Psychic also, but I guess you can get Dragon from the head at least? The body is rather bland, but the bright blue explosion in the sky behind is awesome, and the dark and orange on the ground (or bottom space) is great too!